MIAMI – The race to flee Hurricane Irma became a marathon nightmare as more than a half-million people were ordered to leave South Florida on Thursday. “It is wider than our entire state and could cause major and life-threatening impacts from coast to coast. 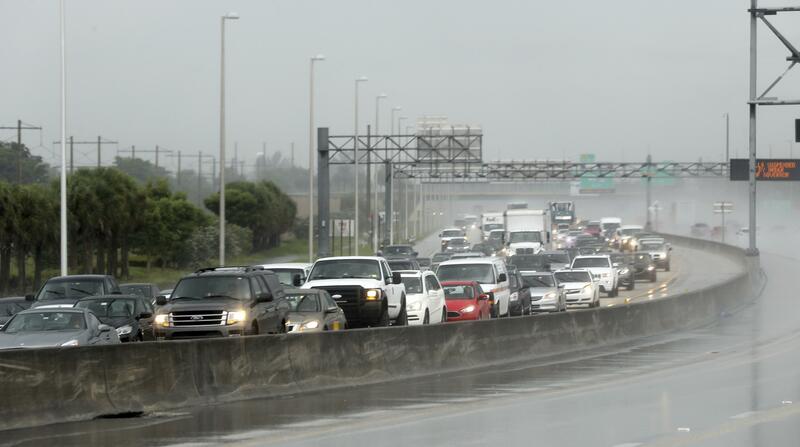 Regardless of which coast you live on, be prepared to evacuate,” Scott said. Most of the critical buildings at Kennedy are designed to withstand gusts of up to 135 mph. Irma’s wind could exceed that if it reaches Cape Canaveral. Noel Marsden said he, his girlfriend, her son and their dog left Pembroke Pines north of Miami with plans to ride out Irma in Savannah, only to find the city was also shutting down because of Irma. Marsden isn’t sure where they’ll all end up. Irma’s eventual path and Florida’s fate depends on when and how sharp the powerful hurricane takes a right turn, National Weather Service Director Louis Uccellini said. “It has become more likely that Irma will make landfall in southern Florida as a dangerous major hurricane,” the Hurricane Center said in a forecast discussion Thursday afternoon. Trump’s exclusive Mar-a-Lago resort in Palm Beach – the unofficial Southern White House – sits in the path of the storm. He said Irma’s intensity set it apart from other storms. “Spectacular is the word that keeps coming to mind. Pictures don’t do it justice. Satellite images can’t do it justice,” DeHart said. Published: Sept. 7, 2017, 10:23 p.m.